Is there a way to replace an object or image without having to re-attach all of the triggers associated with that object? I need to update projects regularly and some of my images that need replacing have up to a dozen triggers attached. I have searched the forum, but anytime I search the word "replace" I get tons of results about the find-replace text feature. Good morning Daniel. Welcome to E-Learning Heroes! If I'm understanding correctly, you'd like to keep the triggers for an image, but replace the image in a slide, correct? If so, you can do this quite easily. First, select the image you'd like to swap out. Right-click on the image and choose "Change Picture". You'll be able to find the image you'd like to use and this will insert the image in place of the previous image. The triggers attached to the previous image should remain, as well. Thank you, Christine. I lost my articulate forum login info, and hadn't taken the time to reset my password until today. Since I asked this question, I've used Articulate so much that I look back on it now as a very basic question. Seeing this thread today actually made me realize how far I've come in the last seven months. But thank you for helping a newbie out. That is so great to hear, thanks for sharing Daniel! This is good for pictures. Is there a way to do this with objects such as a button or text box. I knew how to do the image/picture but can't figure a way to do objects. Here is a wrinkle... Can you change a shape that has associated triggers (or triggers that refer to it) to an image without losing anything? I used a circle shape as a placeholder for a plate graphic that was provided later. Thanks! I don't think it is possible to convert a shape to an image whilst retaining the associated triggers etc. 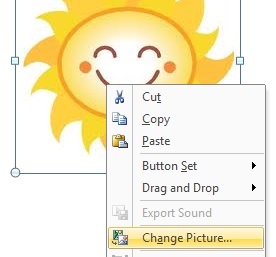 I fell foul of this a while back and now have a collection of basic shapes saved as images that I import as placeholders and then use the 'Change Picture' option as Christine described above when the real graphic is provided. Hi Fred and welcome to E-Learning Heroes! Looks like Antony has you taken care of here. Having a stock of wireframe images is a great best practice. I will do that. It was not too painful to copy the triggers from the shape to the image, though for complex interactions with several objects it would be more of a pain. Thanks for the update Fred. Glad you were able to get some assistance. I am following this feed and am encountering a challenge with "change grouped objects" to button and there does not seem to be a way to get the programmed trigger to stick. Do you have any suggestions? Can this be done? From the feed above, I am not clear as to a simple solution. Thanks! Hi there, Simcha! Yes, you can add triggers to groups. Tell me a bit more about what's happening. Are you able to create the trigger for the group, but it isn't working? What is the trigger supposed to do? If you'd like to share your file so I can have a closer look, you can share it publicly here, or send it to me privately by uploading it here. I'll delete it when I'm done troubleshooting. "Good morning Daniel. Welcome to E-Learning Heroes! If I'm understan..."